Years ago I created this drier for my wife, as a wet weather alternative to the clothes-line and the electric tumble drier. It works very well, even in wet weather, as long as the air is not too close to saturation, and has reduced our need for the tumble drier greatly. 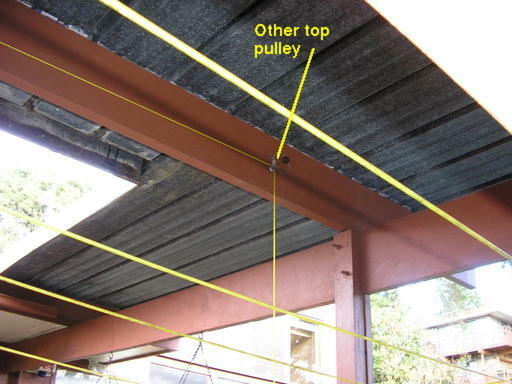 All it is is a light frame slung beneath the carport roof. 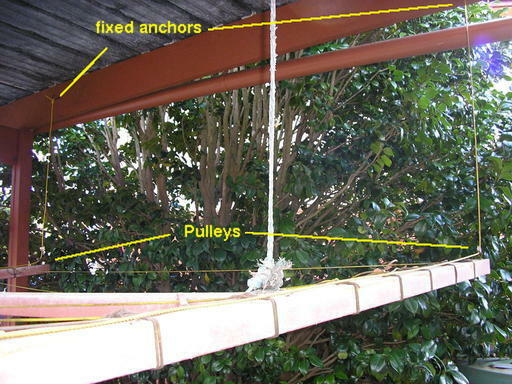 A cheap boat trailer winch, cord and pulleys allow it to be hoisted up out of the wind-blown rain, and lowered to add or remove the clothes. 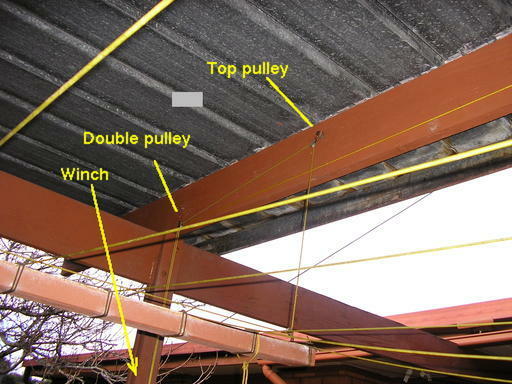 The frame is made of thin steel galvanised rainwater downpipes, held together with pop-rivets. 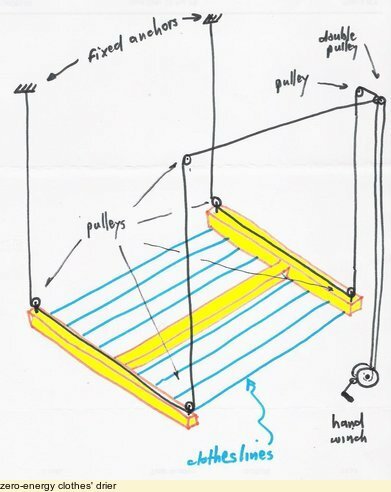 They are getting pretty old and shabby after about 20 years, so its on my todo list to make a new frame: as the H-section frame tends to twist, the replacement will be a full perimeter frame, probably made from pressed steel wall studs, which are light and cheap. 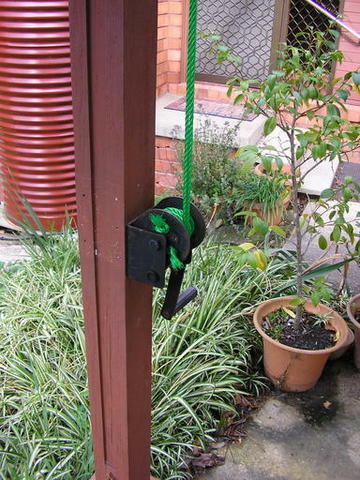 Some pix of the pulleys - originally they were cheap galvanised ones from a hardware store, the type used for awning ropes. 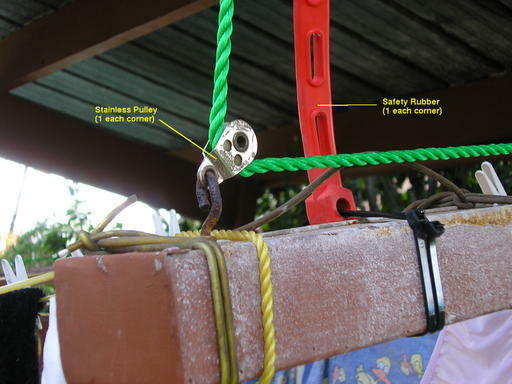 However, they corroded fairly quickly and frayed the cords, so I replaced them with stainless steel ones from a boating shop. 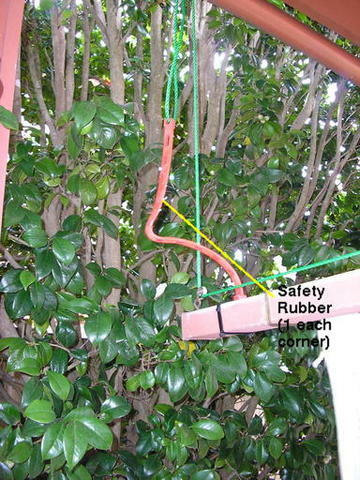 Once when a cord frayed through the frame fell on one of our cars, so I added safety ropes to stop it from falling to car roof level. Later on I replaced the ropes with rubber straps at each corner - we have a better car now!